Organization for Black Struggle is based in St. Louis Missouri. It is close to the Freedom Road Socialist Organization, and the Communist Party USA. The year 2005 marked the 25th anniversary of St. Louis’ largest grassroots community organization. Founded in 1980 by a small group of local activists, the Organization for Black Struggle has grown into a force to be reckoned with in the community. Whether it’s police brutality or unjust incarceration, OBS is committed to fight for the rights of the disenfranchised. Since its inception, OBS has succeeded on many fronts, perhaps none more memorable than the release of wrongfully convicted Ellen Reasonover. Endesha, founding member Jamala Rogers and board member Thomas Mines all agreed this was a defining moment for the organization. On her way to do laundry in 1983, Reasonover stopped by a Dellwood gas station to get change. Although she could see three men inside the station, no one answered her repeated knocks at the window. When Reasonover later learned that she had happened upon a murder and robbery in progress, she contacted police, but Reasonover herself became the chief suspect. She ultimately served 16 years in prison for a crime she did not commit. Had it not been for the efforts of OBS and other committed organizations and individuals, she may never have been released. “‘Grassroots’ doesn’t have to mean rag-tag or incompetent. We have always strived for a work style that reflects the best of our people,” Rogers said. “Whether or not people agree with our politics or tactics, they respect our ability to stay on an issue for as long as it takes to bring resolution. I don’t think there are too many groups in St. Louis who are willing to stay on an issue like the unjust incarceration of Ellen Reasonover for almost two decades. OBS is currently focusing its efforts on the Campaign for Reggie Clemons. Clemons was one of the three African-American co-defendants sentenced to death for their alleged involvement in the deaths of Robin and Julie Kerry in April 1991. (A fourth white co-defendant was given a 30-year sentence after turning state’s evidence against the other three and is eligible for parole in 2007.) The case and three subsequent capital murder trials was wrought with inconsistencies, alleged police brutality and prosecutorial misconduct. The organization hopes to have the case reopened before Clemons is put to death. Along the same lines, OBS is working on the passage of Board Bill 69, which calls for a Civilian Review Board of the St. Louis Police Department. “We are the best-kept secret in the city, and that’s because we are not corporate-sponsored. We are not begging to be sponsored, as such, so in order to get our message out it takes a whole lot of effort in a lot of creative ways,” Endesha said. “It’s an organization that has not been co-opted by any corporation or individual,” Mines said. OBS has survived for the past 25 years because of its commitment to principle, tenacity and vision, along with its deep roots in the community. While some may find an organization like OBS to be outdated and unnecessary in the face of a growing black middle class, members know that a need for the group’s work will continue well into the future. Since August, millions of dollars have been raised or donated to further the Ferguson cause. Older and historically underfunded St. Louis groups like the Organization for Black Struggle (OBS) and Missourians for Organizational Reform and Empowerment (MORE) received six-figure grants from George Soros’ foundations." 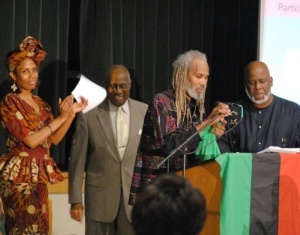 Organization for Black Struggle Elder Kalimu Endesha makes a special presentation to keynote speaker Akinyele Umoja at OBS’ 33rd Anniversary Celebration as co-emcees Azizi Blissett and Bernie Hayes look on. Steve Phillips donated to a St. Louis nonprofit group called the Organization for Black Struggle that helped organize 2014 Black Lives Matter-related protests in Ferguson, Missouri, over the police killing of a black teenager named Michael Brown. And Phillips and his wife, Democracy Alliance board member Susan Sandler, are in discussions about funding other groups involved in the movement. Organization for Black Struggle activists. Sat. January 27, 2018 4 pm Omega Center 3900 Goodfellow Avenue. Reema Ahmad of CAIR - Chicago with Organization for Black Struggle, August 2018. Jamala Rogers with Tefere Gebre and Neidi Dominguez 2017. This page was last modified on 13 March 2019, at 00:45.